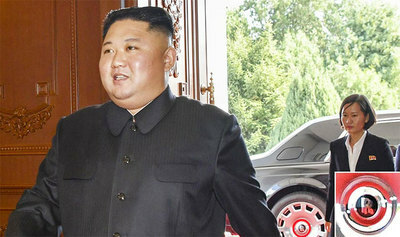 North Korean leader Kim Jong-un handed out Swiss wristwatches to senior officials at the seventh Workers Party Congress in Pyongyang in early May, Asahi Shimbun reported Sunday. "Swiss watches were presented to about 100 senior officials, such as members of the party Central Committee and armed forces generals, among some 3,600 participants of the party congress," the Japanese daily said. The watch faces were emblazoned with the logo of a brush, hammer and sickle to symbolize the party, the daily said. The regime asked the manufacturer to leave out the "made in Switzerland" mark. The manufacturer is unknown. The UN Security Council banned the sale of luxury watches and wine to North Korea some 10 days after the party congress. Kim, who went to school in Switzerland, is particularly fond of Movado watches. He has often doled out Swiss watches to buy the loyalty of senior officials.